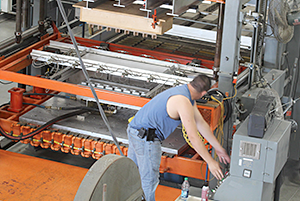 This type of thermoforming employs air pressure to pre-form the sheet of thermoplastic prior to the sheet being pulled down onto the mold. 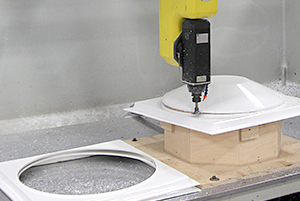 These high-speed trimming machines are used by FSI as an essential tool in prototype and part formation. The first step in part-development. Concept development involves the creation of a computer model that depicts the eventual shape of the part to be manufactured and the mold that will create it. Once approved, this design informs the rest of the production process. A less well known but growing thermoforming market that typically deals with thermoplastic sheets with a thickness between 1.5 mm and 3 mm (0.060 inches to 0.120 inches). A type of thermoforming that uses the additional force of air pressure along with the vacuum force that is standard in thermoforming. 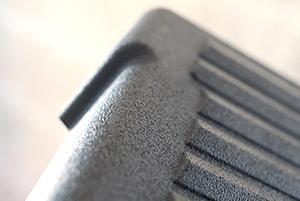 This type of thermoforming is ideal for parts that require a very high level of precision detailing. FSI is proud of our in-house prototyping capabilities that allow our clients to thoroughly and accurately review part design before that part is mass-produced. The pattern used to create these prototypes is formed from wood or other types of easily malleable materials that can be quickly and easily changed if need be. This stage of development is made to test tolerance capability, tooling concepts and manufacturability. A type of thermoformer that allows for a high rate of production. 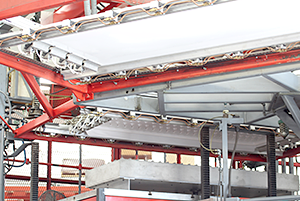 The rate of production is high because this system has the ability to simultaneously load/unload, heat, and form plastic parts. 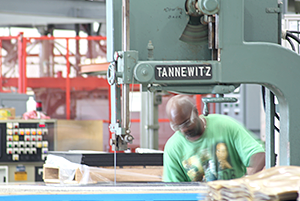 A manufacturing process in which a plastic sheet is heated and formed over a mold. This process results in a detailed plastic part that can be customized to possess different thicknesses and properties depending on the desired application. When compared with injection molding, thermoforming is a more financially viable alternative for all but the most mass produced products. In addition to significantly reduced tooling and production costs, thermoforming provides a significantly faster product development time. 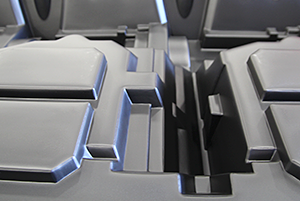 Typically created from aluminum, our thermoforming molds are durable (they last much longer than ceramic or wood alternatives) and come with a low tooling cost. Aluminum also provides the design flexibility our clients need. A plastic polymer that, when subjected to increased temperatures, becomes soft and pliable, and then reverts back to the original solid state upon cooling. Common thermoplastics include styrene polymers and copolymers, vinyls, nylons, fluorocarbon materials, polyethylenes and acrylics. 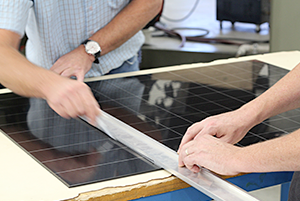 Thermoforming that deals with plastic sheets with a thickness greater than 3 mm (0.120 inches). Parts produced at these gauges are sturdy and are often used as structural components. Thermoforming that deals with plastic sheets with a thickness of less than 1.5 mm (0.060 inches). A type of thermoforming that forms a part by creating a vacuum between a heated layer of thermoplastic and a mold. The vacuum pulls the malleable plastic tightly over the mold, so that the resulting part be fully detailed.